It would be difficult to understate my pride in this grip, in spite of it's imperfections, I am very pleased with it, it represents my successful attempt to perform all deals from the same grip and to do them well. This is definitely my preferred grip, particularly for centers, Greeks and bottoms and I suspect in many regards others will come to appreciate it as well. It is not without faults as I will discuss later, but it makes some of the most difficult sleights accessible and eliminates any real need to learn another grip save for dealing one-handed. Ironically, I discovered this grip, at least an earlier conception of it, when I was first learning to bottom deal. 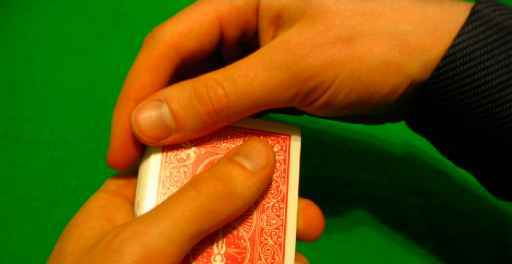 I was sitting at a desk practicing bottom dealing from somewhere around a shifted or mechanic's grip and doing so somewhat slowly as I was still having problems. My brother who knew and still knows virtually nothing of cards asked what I was doing as it seemed tedious and monotonous to him. I explained that it was very difficult and that I would like to see him try, so he said ok and took the pack in his hand and began dealing. Naturally, this did not involve the elegant mechanic's grip I was using, rather it was something that seemed more clumsy, almost the grip you might use on a bat, with all four fingers on the one side of the deck wrapping around it slightly with the thumb across the top. 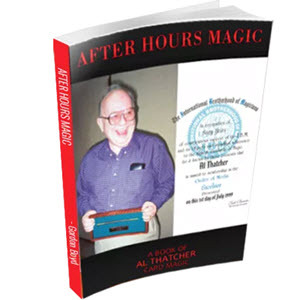 He sat and dealt off cards, then said everyone once and a while I was pulling one from the middle, which he attempted to do and to his credit succeeded at through the disorderly nature of the pack. I mentioned that the cards were coming from the bottom and he needed to make it invisible, so it looked like he was dealing from the top. He pointed out that mine deals weren't invisible and so I stated that this was why I needed to practice more. 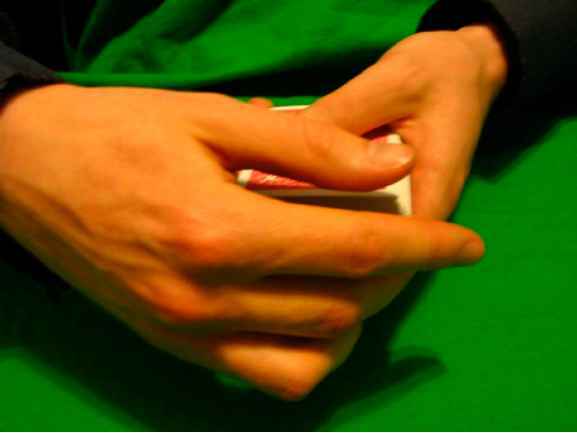 What interested me about his method, was he was dealing the cards from the front of the deck where no fingers would get in the way, his grip was, granted, unsophisticated and far from superb, but the idea was an interesting one to me. I took it and tried dealing in that manner a bit and then gradually began shifting it, moving my forefinger underneath, refining my handling, loosening up and shifting the fingers some more. 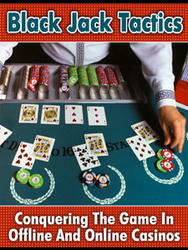 I continued to refine this slightly for a period of some days and weeks, while still practicing my regular bottom deal. At the time I was not particularly adept at card handling, but I was familiar with the glide and I was aware of the Greek deal concept, so the concept of gliding the bottom card on the deck in order to perform a Greek deal likewise seemed appealing. 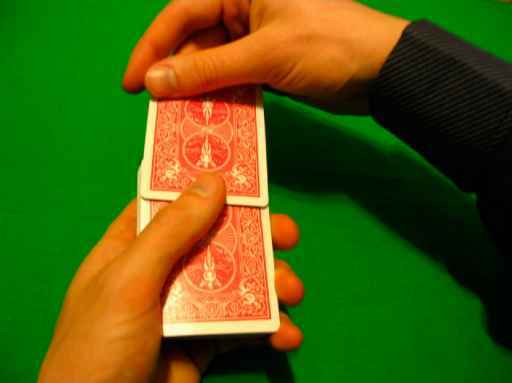 I hadn't begun practicing a second deal at the time, but I figured I could also glide the top card with my thumb in order to perform a second deal, for the time being though, my efforts centered around a bottom deal. 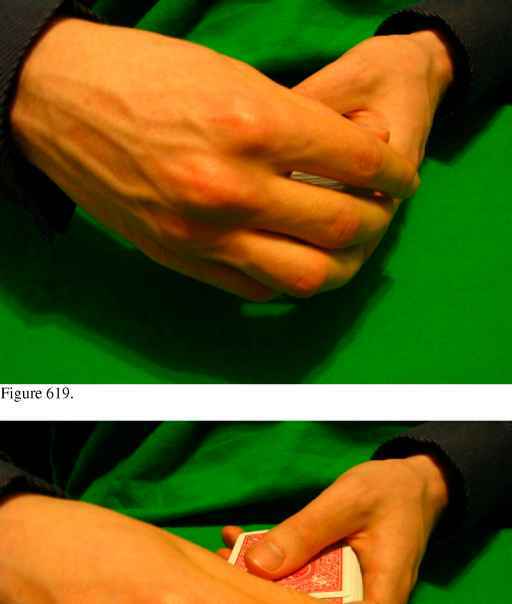 I quickly came to love this grip for bottom dealing as I discovered I could snap my wrist out in order to perform the deal at great speed and so I continued my refinements. Gradually, I began practicing Greek dealing from this grip and to a very limited extent, seconds, while at the same time searching for a method of dealing centers.. .that search was less than successful. The more I worked with this deal however and the more I learned of the faults of other false deals the more this deal seemed appealing. I remember sitting in front of a mirror one night, exposing the view entirely and dealing both tops and bottoms, watching to see if I could see the top card come off of the deck and getting to the point where I couldn't, even when I was dealing tops. Thus was born the invisible deal that has only improved since then. This deal is not perfect, but I found that if nothing else, it makes the very difficult Greek deal quite easy and that I think is appealing to a great many. It is actually quite recently that I finally came up with what I consider to be a satisfactory, dare I say, even a good center deal from this grip. 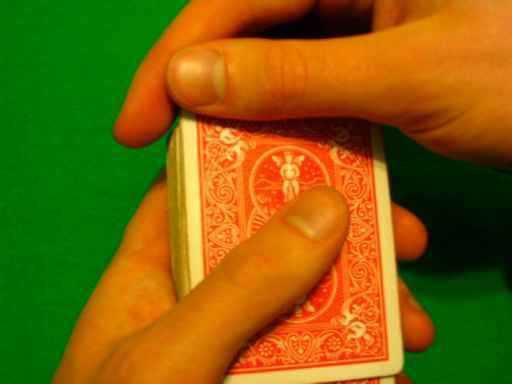 Originally I had intended to explore all the variations on technique of this grip, of which I have numerous including probably five very different center deal handlings to go along with different incarnations of the Greek deal, double deal, bottom deal and second deal. However, unexpected time constraints have limited this exploration and so I shall only examine for you some of the better ideas, though perhaps at a later time I'll share the variations that developed during the search. Perhaps then it is time to begin with an explanation of this most wonderful grip. This grip really doesn't waste any part of the hand as each part performs a function or potential function, and again, that is one of its beauties. So now I believe, you are ready to begin dealing. I should perhaps first mention that I recently discovered there is a bottom deal called the "SF Bottom deal" that is similar in a sense to this deal, however, from what I am aware this deal is much more refined in spite of the fact that the two are visually somewhat similar. The two have no relation to one another, the "SF Bottom deal" dates to well before I became involved with cards and I was not aware of the deal until well after I had completed my work on the Count's grip and even today I remain ignorant of the details of this deal. You should note the position of the right hand, which is twisted to a slightly unnaturally high angle. 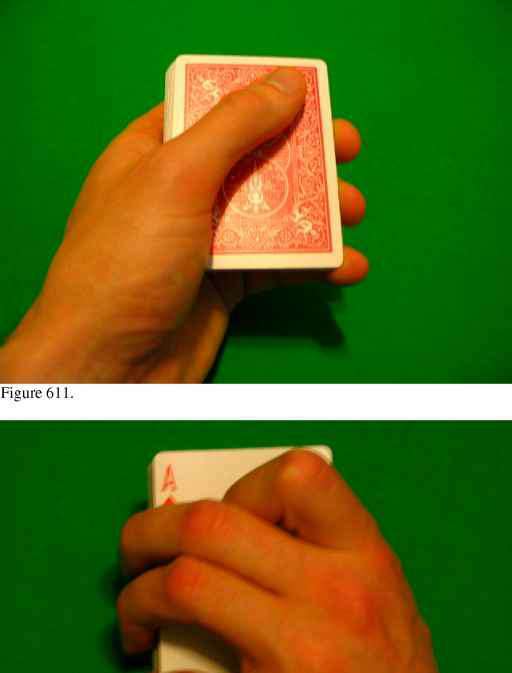 This is yet another beautiful aspect of this grip, most grips involve a slight amount of neck tying, in fact they almost require it, but the Count's grip does not, in fact generally the deck remains roughly level the whole time I'm dealing. However, as you move your hand in to perform the take, it completely covers a view of the deck and in particular the take from anyone looking from the front, or even as far over as the eleven o'clock position (perhaps even the ten o'clock?) and everyone to the right of this point (from your perspective, naturally being across the table from you this would be their left). Meaning that only a very small portion of the table (those between about the ten and seven o'clock positions are able to see the take. 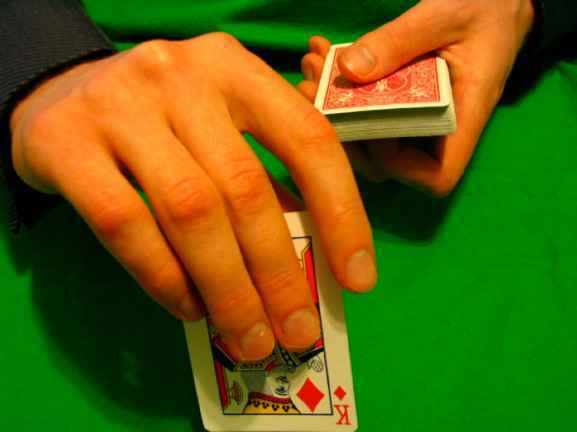 In order to increase this advantage further, I turn myself slightly so I'm facing about the ten or nine o'clock position in order to aid in dealing to those on my left, while I am still able to move my hand and toss the cards to those on my left without shifting my body. This is actually completely natural, since you are able to deal much more effectively to your right than you left, though granted one should remain aware of the situation and shift if the need arises. Finally, if you had the need, you could always tilt the deck slightly to the right and obscure a top view from your left, though I find this is generally unnecessary. The entire condition is beautiful as it seems wonderfully fair and the deal occurs so quickly that a strong retention of vision occurs on the part of the audience while in fact they saw nothing for a fraction of a second. (I would recommend you try this in front of a mirror in order to fully appreciate how brilliant it is.) Basically, it is like getting all the benefits of neck tying without actually neck tying. (I should note that whenever possible one needs to remain mindful of angles, particularly with this deal which although it does not require them, it benefits from them considerably. Often you'll find yourself in a situation where you are able to manipulate the situation, either by where you choose to sit or otherwise in order to better control the situation. 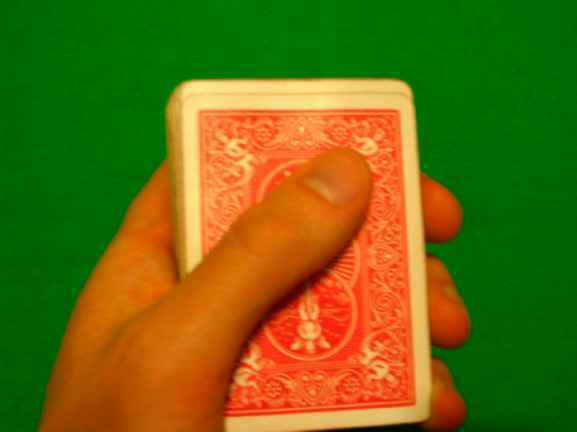 This works quite well, though I should note, depending on the circumstances, you may not wish to flick your wrist but merely move your hand forward, you may also wish to position your forefinger under the card slightly, but more on that later. It is important when you perform the take that you do so in a level manner and be mindful of this because there is a tendency to move the hand slightly downward, which is harmful later. I once had someone sit and listen to my deals in order to detect the false deals by sound and he did reasonably well, at which point I refined my handling considerably, level is the way to go. There is sound on this deal and you want there to be sound because you can't eliminate it from the second, center and Greek, but you want it to come from a level take. This level take will help to unify the sound of each of the deals and when in doubt you'll be able to cover the slight differences with other sounds. 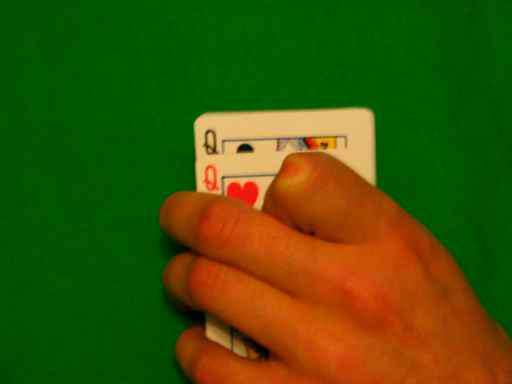 Incidentally, another advantage of this hand cover is that the card you are dealing from the deck only becomes visible just as it is about to come off the deck. Meaning that, while the economy of motion is sacrificed by a forward take, you make up for it by reducing the window of version to an even smaller one than with a side take. This is a good reason to perform a quick deal and hopefully a "tight" deal, in case you end up suddenly having to go back and correct a problem like this you'll hopefully be able to do so. 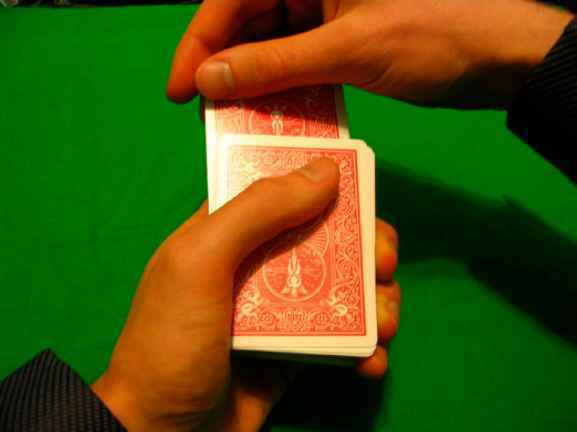 Another little flourish you can do if this is a problem is to, immediately after performing the take, swing the card back inward, coiling for a toss and then tossing the card across the table to the given player. 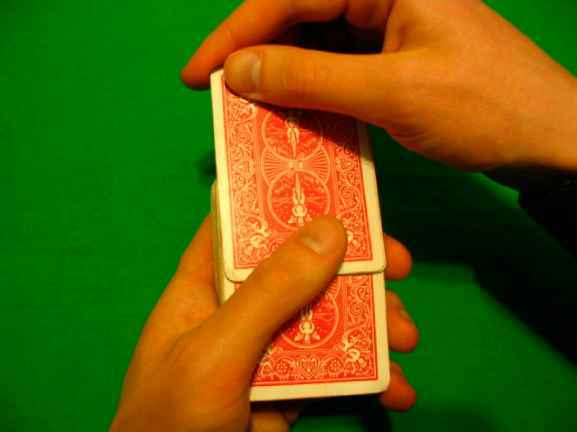 In this motion covering the deck, you can move your forefinger from beneath the deck up to the front where it can square the cards quickly before returning below the deck. 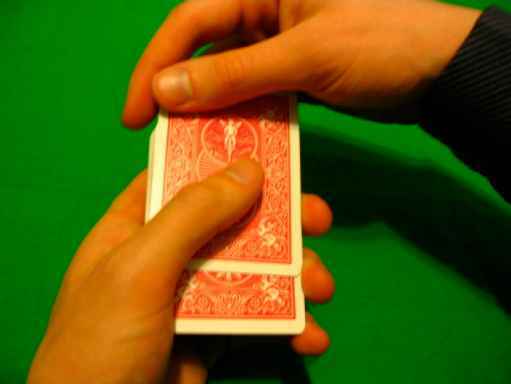 You may even find you are able to use your right hand in the process of the flourish to square the cards. (See figure 622 and 622a for the flourish motion). On reflection, depending on the circumstances you may wish to make this flourish motion a standard part of your deal, first so it doesn't look out of place, second as a sort of casual flourish and third because it allow even more cover for thumb movement. Really though, once you become adept at the deal hangers are very rare. I find a delicate touch and a level take virtually assure this, though you may wish to try playing around slightly with your handling if you're having problems. 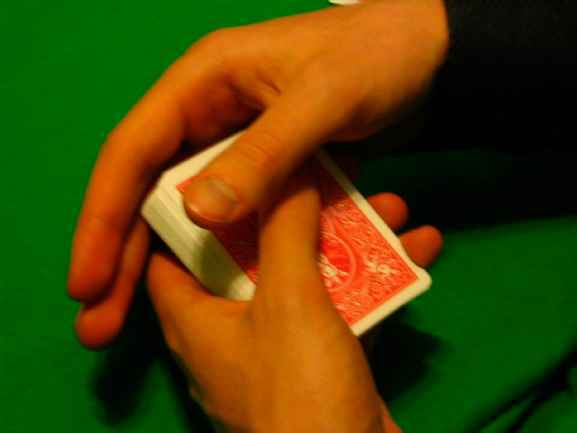 Generally, the only reason for hangers may come with a particularly sticky deck, in which case you may wish to consider not false dealing depending on what is at stake and the awareness level of your audience. Ideally, your audience isn't alter and even if you have a hanger you are able to correct it before a problem develops. I think then that I have covered to a reasonable extent dealing tops and seconds from the Count's grip and we'll progress to doubles. The process is really that simple, don't toss the cards, deal them to the table. My only real word of caution would be to please ensure your take is level. 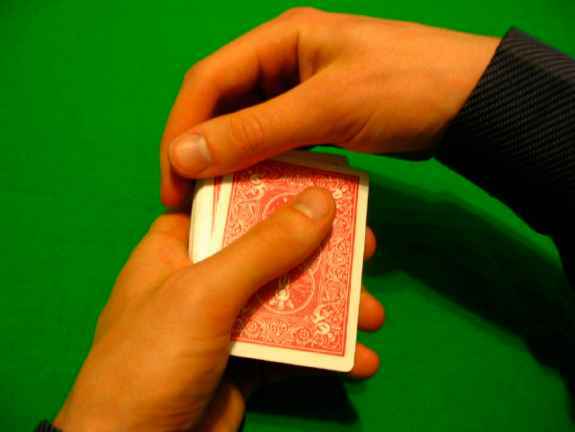 I've had numerous times when I'm practicing at a high table and been dealing off rounds of poker only to arrive at the bottom deal and hear a slap as the card strikes the edge of the table due to a pre-mature drop in its level. You also need to make sure the deal makes noise, it is very easy from this grip to perform a silent bottom deal, but you want noise so it is the same as the others, just remember, level take. 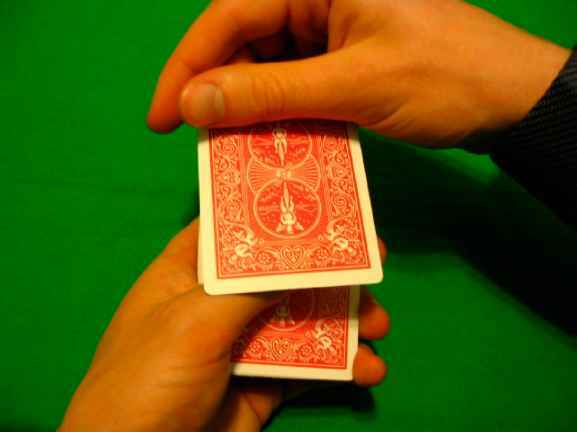 It is I suppose worth mentioning that in my experience dealing the cards off in a forward manner so they remain square with the right and left edges of the deck during the entire take is the best method. 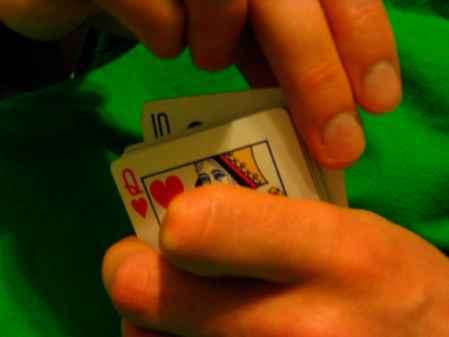 Sometimes during a bottom deal a portion of the card may slip to the left slights and become exposed. However brief, this is an unnecessary and undesirable tip-off, especially if someone is directly to your left. 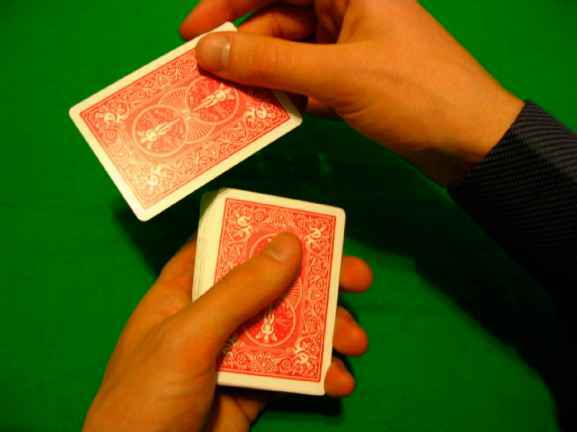 From this point you'll find you are able to perform your conventional bottom deal take, or, if you chose not to glide the card quite so far, you could perform a double bottom deal simply by adding a squaring take. Now, the issue of exactly when and how to glide this card arises, I actually have two other methods I sometimes use, but I feel generally this one is the best. 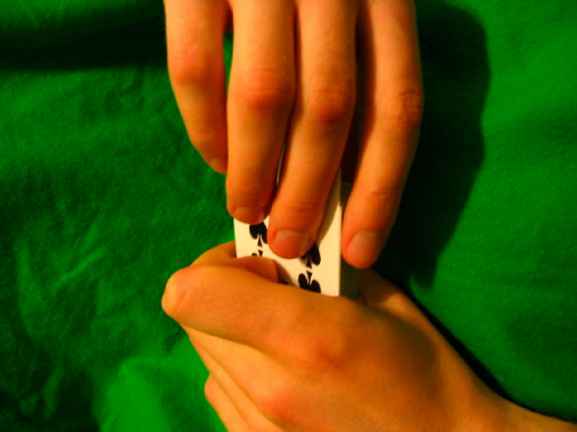 While the act of gliding the card is certainly subtle and thus one could easily perform it openly before each Greek deal, I don't recommend this as it creates unnecessary risk and difficult handling. If you wish to perform the glide for each deal, I recommend you do so under cover of the hand as you did with the second deal. 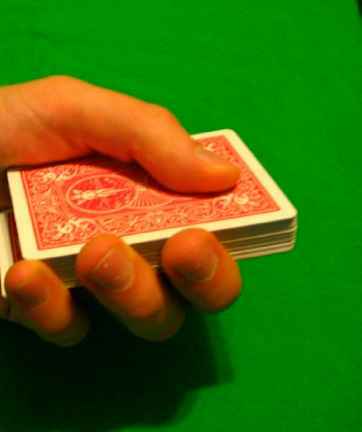 However, personally, I generally simply glide the card once at the beginning of the shuffling sequence and leave it in the jogged position until I'm done dealing quite simply because it's easier and causes me less worry. The only real risk then is an over the shoulder view and most people won't be performing a false deal when someone whose fast company is staring over their shoulder anyway. Frankly, for most laymen you could perform a heinous false deal and get away with it and this is anything but. Really then, do as you please, but generally (not always) I prefer to simply jog the card once. Now I did say every portion of the hand is used with this grip, but we really haven't employed the pinky yet, it is with the center deal where it will see its finest work. I must say, I had a very difficult time coming up with a working center deal from this grip. I suppose it shouldn't come as a surprise considering performing a center deal from virtually any grip is tough, but I did find this one particularly difficult to conceive and spent a long time considering it, everything from breaks to jogs, to glides and shifts to opening a break with the take hand and others. Finally, not too long ago, I came up with this method. Originally, I actually performed it in reverse, dealing off the top half of the bottom packet rather than the bottom half of the top packet, but I felt this was too obvious. Then I shifted, and use the middle finger to control the top packet while the pinky controlled the bottom packet though I found that technique quite difficult and ineffective. I've finally settled then on the method I'll describe. I think probably of all the center deals I've mentioned in this book, this is probably one of the best, though not necessarily one of the easiest. It's the best because there is no visible or obvious movement (visible being the key as a lot may occur under the cover of that hand though the movements that do occur are not huge or glaringly obvious) and because it lacks any huge tip offs such as a massive break. 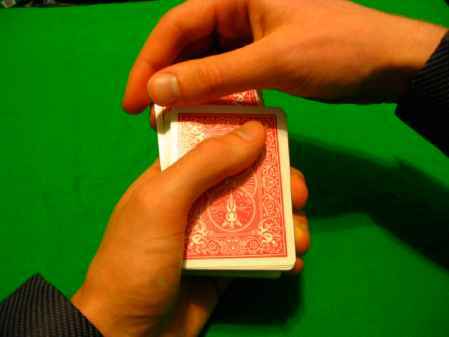 I remember the first day I came up with this method, I was toying with a deck of cards as I often do, my brother who is familiar with cards and sleights was sitting at the table with me. I performed the deal a couple times slowly for myself, then had him watch as I performed it quite slowly and asked him if he could tell it was false, he said no, he couldn't see anything. Now at the time I realized and mentioned that my angles were favorable, but it was also noteworthy that being my first time my technique was rough and my deal was slow, that was also the earlier rendition of the deal where the middle finger offered the control instead of the pinky. I offer you then, this deal, which, though not perfect has won my affections more than any other of its class. Notice how little this break is visible from the right due in part to the three-finger cover offered. Notice also, the exact manner in which the pinky sits holding this break. It is a post fixed not on the right side of the deck, but wrapped around the back of the deck. This is important in two regards, the first being that it is able to apply a pivoting force on the deck. 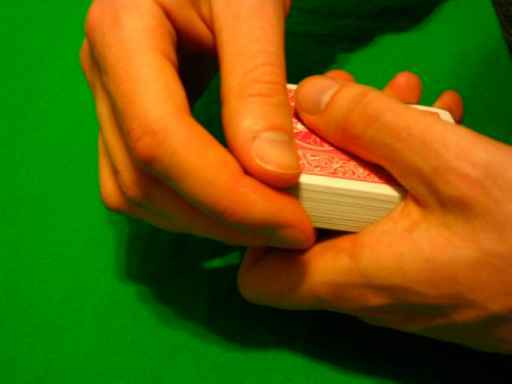 Second, it is wrapped around the back, not positioned behind, this allows you to job the bottom card as in a Greek shuffle without the pinky interfering, while always maintaining this position regardless of which deal you're performing. 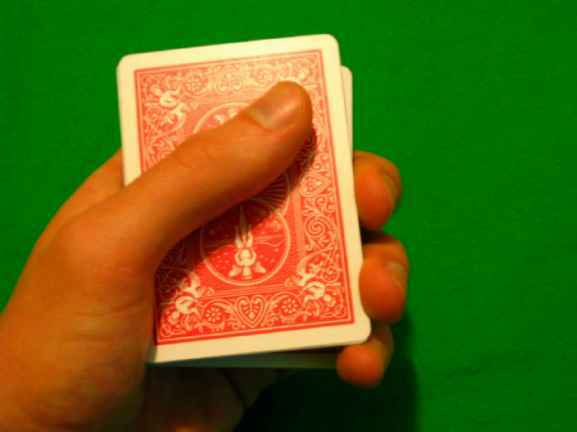 Both your middle finger and ring finger apply pressure in order to help properly square the side of the deck and, as the card is dealt from the deck, the deal is completed. The idea with the forefinger, if it is rendered functional, would be to strike the left side of the deck as the top half is pivoted back into place and to assist in squaring the packets. If you must perform this deal openly (that is to say in such a manner that angles are not favorable), I recommend a slightly back and forth movement of the wrist with each regular deal in order to help better cover the pivot action of the center deal when it comes. Ideally, however, it is performed under the cover of the hand. This action is very easy and, I feel, totally satisfactory given the context. That then concludes, I believe, my description of the Count's grip, which I hope you will employ to great success. It may feel awkward at first, that's because it's new and you'll find it quickly becomes comfortable, at which point you may just find yourself growing fond of it.